Farid’s Rickshaw Ride » TOGHER N.S. Pupils from Togher N.S. completed a series of Developmental Education lessons today with the guidance of Penny. She read Farid’s Rickshaw Ride – Farid’s cousin is visiting from Ireland! In preparation, Farid journeys around Dhaka to collect flowers, fish and blankets. On the way, the rickshaw puller shares some of his experiences which give insight into life outside the city and prove helpful to Farid in his errands. But an accident brings home how quickly life can change- and a surprise visit shows Farid that there are other links between Ireland and Bangladesh. Farid’s Rickshaw Ride is the story of a boy’s eventful journey around Dhaka. Beautifully illustrated, the story includes different perspectives on Bangladesh, Ireland and our global connections. 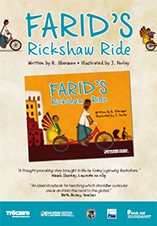 The programme provides activities and resources for using Farid’s Rickshaw Ride for cross curricular learning in senior primary school.